These silk animal scarves are the creation of Cléo Fern Mercury, an independent, London-based accessory designer specialising in playful silk scarves. Having launched her brand in 2010, Cléo's previous collections include a range of square silk scarves depicting icons such as Brigitte Bardot, Grace Jones and Elizabeth Taylor, that you may have seen selling via Tatty Devine. 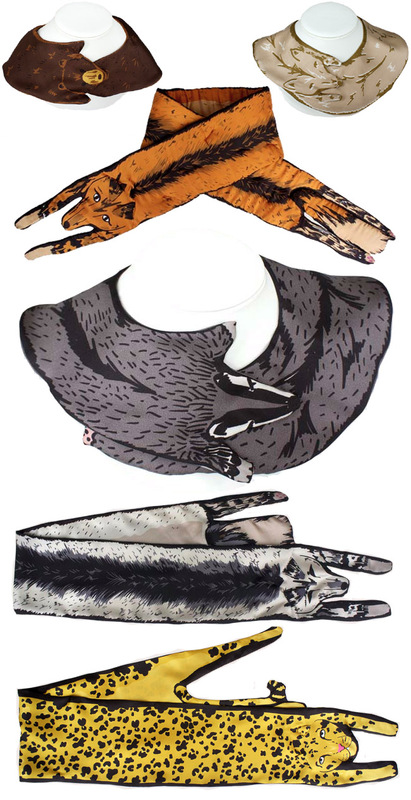 The latest collection depicts a range of animals fashioned into scarves and collars and is right up my street! Personal favourites include the red fox and the badger. I love that the scarves are a modern twist on the rather gruesome fox stoles you can often spy in antique shops and flea markets. Thankfully, Cléo's scarves offer a much more animal-friendly alternative! These are great! The fox and the leopard are the best, but who wants a badger round their neck? Who DOESN'T want a badger around their neck? If we hide the badgers around our necks and pretend they are scarves then they won't get killed in the cull. Win win.